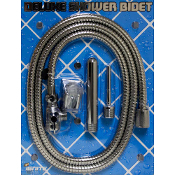 Deluxe Shower Bidet made of flexible stainless steel. Includes 6 ft hose, wall mount and 2 interchangeable heads. Professionally Designed Smooth Sleep Appearance Comfortable Attachments Easy to Install Nozzle Sizes: Large: 5" (12.7 cm) Long x .75" (1.9 cm) Wide Small: 3.5" (8.8 cm) Long x .25" (.63 cm) Wide Directions: Fits Standard US shower heads. Follow directions for installation on package. Warning: Prolonged and frequent use is not advised or recommended as these items are sold for novelty purposes only. Should be used with discretion. Made In: China Sold as an adult novelty only.